What we teach our children and values which we inculcate in them, will go on to mould them into either very inspiring or very lazy adults. It is very important to always be careful about what you say as well as how you say it. When you are in front of children, chances are that they are going to emulate you and they might try their best to follow in your footsteps. So to ensure that, the future generation is going to be made up of right minded and kind individuals. You have to start nurturing them with love and care from a young age and encourage them to dream big. 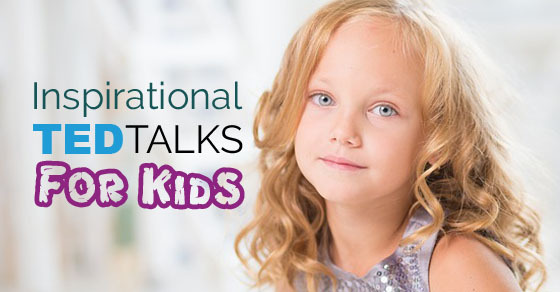 The following mentioned are few best ted talks by kids which are very popular and inspiring. It is a common misconception that only children must learn things from and emulate the adults, where as in actual fact it is adults who should learn from children. Children are able to speak their mind without any inhibitions and without caring about what society might think of them. This young mind is indeed a forward thinker who urges adults to come forward and learn a thing or two from their young ones as well. This ted talk video has something to teach both to young children as well as adults who think that they are wise and advanced to learn anything from children. This little eleven girl, who began playing the violin at the tender age of four and went on to make her debut at the age of nine, is indeed a store house of talent. Not only is this young one a great inspiration to children across the globe, but also brings home the fact to adults that age is just merely a number and that if you put your mind to something and have a genuine passion for it then it will never seem like a burden to you at any point in time. This young girl is very charming and poised and she even goes so far as to even praise the design of her musical instrument, which she has been able to master. In this twenty first century technological age which we live in, children make use of technology from a very young age indeed and not only do they learn to use gadgets and gizmos but they also master them. Each one of us have various apps on your smart phones, tablets as well as laptops and while all other children were busy trying to download the latest apps on their phones, the young Thomas Suarez was trying his hand at making his own app and learning new ways in which he could improve on it so that it is more user efficient. His ted talk is indeed remarkable and encourages children to have a curious bend of mind. The more you encourage children to think in an empirical manner, the more they will try their best to get to the root of things and come up with solutions to issues. This is exactly what the brilliant Lauren Hodge, Shree Bose, as well as Naomi Shah, embody. They are three young women scientists that have come up with ingenious ideas and observations. Laren Hodge in this best ted videos speaks about how grilled chicken which we perceive to be very healthy, might not be very healthy at all. Shree Bose, takes on a more serious topic about the possible resistance of chemotherapy by ovarian cancer and finally Naomi Shah, talks on issues like air pollution and asthma. As all of us might recall, growing up is not easy at all and while growing up we were faced with a number of problems as well as doubts which happened to cloud our mind. Tavi Gevinson in her ted talk is very eloquent indeed and she speaks about how she created a space for other girls of her age where they can come together and discuss various things which might be playing on their mind. Children often receive the best advice from others who are their own age. Parents should try their best to be understanding to the psychological plight of their children. Large and ferocious animals that survive on land as well as the sea are nature’s way of curbing the ambitions of man and safe guarding their own territory. While there are many people across the globe that travel to Kenya merely to get a look at the big cats that survive there, but it is a big problem that locals have to face due to the impingement of these big cats on the locals living area. What this young man speaks of in his ted talk is how he has made use of simple everyday things, to keep these lions away from the villages of the locals so that they can live in peace without having to worry about these predators. Each one of us has our own individual talents as well as hobbies. Sometimes things which we are good at might not necessarily be the things which we love doing. There are some individuals that are able to really follow their dreams and passions and work tirelessly toward achieving their goals. The young Jennifer Lin is a young lady who in her most inspiring ted talks, explicates on her process of creativity on the piano. Many of us learn how to play the piano as children, but her approach of mastering this instrument is indeed inspired. Pancreatic cancer is something which has claimed a lot of lives, because it is tough to detect it in its early stages and often, once it has been detected it is already too late. Jack Andraka is a young boy who in his ted talk, mentions about his revolutionary test for detecting pancreatic cancer in its early stage and with some developments it could go on to save innumerable lives in the time to come, yet for the time being this young genius has bagged the world most renowned largest science competition in the world. Projects like this are bound to inspire many both young and old. Beau Lotto is someone who is not merely an educator but he is also a neuroscientist and a artist, what he believes is that science is something which is not merely meant for adults, but kids too have a scientific bend of mind and creativity. This scientific bend of mind comes primarily because they are so sensitive to the world around them and they do whatever they can to come up with answers to the questions which they have. In the ted talk a student of Beau Lotto, a young Amy O’Toole even comes on stage so as to explain the experiment which had been carried out. This is the best ted talks education video for kids. In this Ted talk for children not only do we have Ryan Henson Creighton but we also have his little daughter Cassandra Creghton, where together this father and daughter duo have come with an ingenious game that is very popular indeed. Sometimes leaving kids to their own devices is a good idea, especially if you think that it is a way they will learn from their mistakes most efficiently, yet on the other hand if you hold their hand and guild them along the way then together not only will you be able to make some memories but you will learn a number of new things. In the rat race called life, everyone is desperate to get ahead and in the attempt to get ahead people do not take into account the moral consequences of what they are doing and in addition to this they do not stop to ponder upon how the environment might suffer as a result of such pollution and degradation. Gabe Dunsmith, a young man, who also happens to be a cancer survivor, speaks about the terrible condition in South Asheville that has been instrumental in bringing about the disease which befell him at such a very young age. He says, ‘One-day people will make the right decisions’. 13. Birke Baehr: What’s wrong with our food system? It is sad but true that most of us are not even aware of where our food comes from and whether the so-called healthy vegetables which we eat are actually good for us or whether they have been bathed with fertilizers, chemicals as well as pesticides. This young man speaks about what exactly is wrong with our food systems and goes so far as to give visuals of how unkempt the farms are where our food comes from. He stresses on how it is better that our food and produce is locally grown so that we can even purchase things at a cheaper rate and be sure of the quality. As mentioned above your childhood is instrumental in determining the kind of individual which you will grow up to be, in this ted talk Wigan speaks of how a lonely and secluded childhood without any friends has taught him to appreciate tiny things and to even go so far as to create art so tiny that, it cannot even be seen with our naked eye. In his talk, he presents a slide show of his range of art which are nothing short of being amazing and absolutely beautiful. His talk is very inspiring especially for those children who might be feeling a little sad that they do not have any friends. It has often been noticed that in those families which have very little amenities, the children try their best to make use of whatever is at their disposal to make things which can help their families in any way which they possibly can. William Kamkwamba speaks in his ted talk about how at the tender age of just eleven he was able to do something absolutely incredible, which is building a windmill for his family’s use. He made this windmill simply from rough designs which he found in an old library book. This windmill was built from simple scrapes and spare parts. This is one of the most popular Ted talks. The above-mentioned ted education talks are specially designed for inspiring children. These top ted talks for kids are very motivational and interesting as well. One of the worst things adults can do is try to keep their children’s creativity under wraps and encourage them to act in an adult manner. When the environment is conducive, then children come up with revolutionary thoughts, ideas and even statements. You might even note that not all of these inspirational talks have been delivered by adults, many, in fact most have been delivered by children. It is children who will be able to speak most coherently as well as comprehensively to other minds of their own maturity. Next articleHow to Write an Impressive Resume Objective?